Welcome to the Artistic Outpost Design Team January Blog Hop! Each month, the fabulous designers at Artistic Outpost showcase projects created with various Artistic Outpost stamp sets. This month, the Designers are sharing projects they created using a Transportation theme. My form of transportation is ice skates! I used stamps from the Artistic Outpost Skating Emporium stamp set. I masked the sentiment from the skating collage ATC image then stamped it in Coffee Archival on Vanilla cards stock. 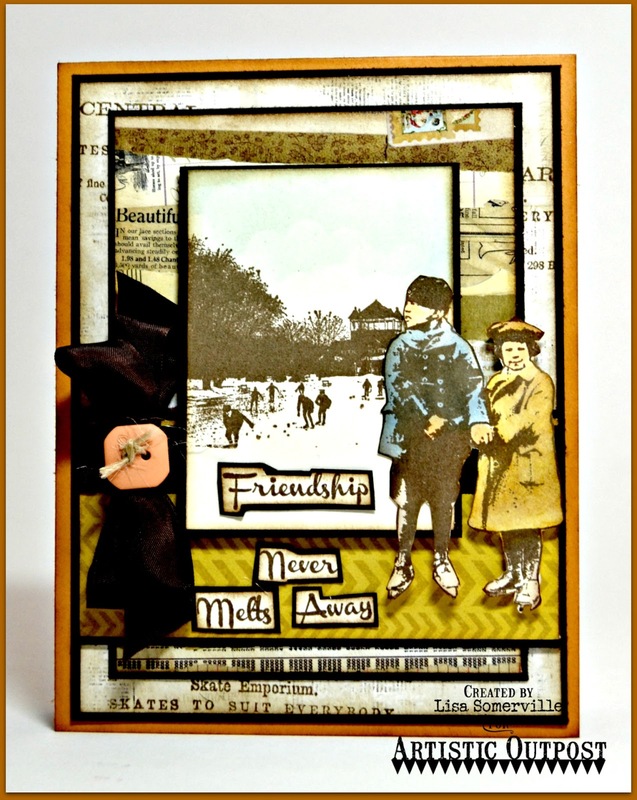 The sweet children in their vintage skates are stamped in Coffee Archival on Vanilla card stock and colored with Ranger Distress Inks, sponged with Gathered Twigs Distress Ink and popped up on the panel for added dimension. I randomly stamped the "central park" on the background pattern paper panel. To embellish my card, I added Vintage Brown Seam Binding and a Button tied with twine. I love the picture in the background with the people standing in front of it. Great jobl. The masking on the skating collage image is so effective and brilliant with those adorable kids. Great layers and finish as always! Love it! Love your take on transportation! Lots'a layers that really make this card pop! Wow! Lisa I love this set and I LOVE how you used it here! Awesome card! Love these images, and what great layers with them! Gorgeous!